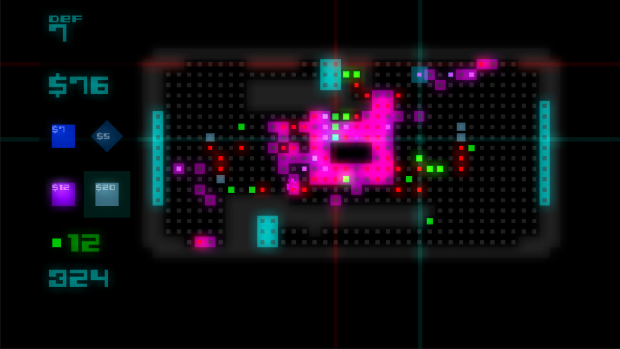 Today I added a small but significant feature to Def - an indicator of where bases are being captured. While most of the fundamental features of Def are now in place, there are always little bits of polish that can improve the gameplay experience. The feature I added today is one such feature. During playtesting, I've noticed that at times you'll have attackers getting through to your bases somewhere, but you can't quite figure out where. You'll be happily reinforcing defenses in one part of the map, only to hear the dreaded 'bllarg' sound that indicates your perimeter has sprung a leak somewhere, probably off-screen. Sometimes it's not immediately obvious where the leak occurred. Hunting around for the break in your perimeter - ain't nobody got time for that. See that red crosshair - an enemy just successfully 'captured' right there. To make this a little bit easier, today I added a 'red crosshair' that momentarily appears over the base that was just captured. This gives an immediate indication of where the problem is, and saves frantically scrolling around to find the leak. There are various other ways that RTS games handle conveying this type of information - indicators on a minimap, showing arrows or 'hot edges' at the side of the screen. I think the method I've chosen is good one since it fits the visual style of the game nicely, while still conveying the information you want.